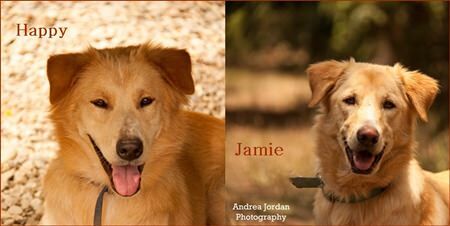 Meet Happy & Jamie, two beautiful Golden Retriever mixes that can barely contain their irrepressible joy of life. Both are young, energetic and full of spirit. They wish for nothing more than a home where they will be treated kindly with affection and are able to get in plenty of play time and exercise. Goldens are very active dogs that live for their humans. They are loyal, intelligent and very trainable. Be ready to spend plenty of time with your golden companions as they crave contact with people, and with proper guidance, you will never have such a loving, obedient friend for all the days of their life. Happy is a female that came to us after she was hit by a car. She has recovered and has only a minor limp on her back leg that does not slow her down in the least. Jamie is a male, in perfect health and ready for his second chance, too. We hope they can be adopted together as the only thing that’s better than one Golden -- is two!